This is an extremely hard to find E. Howard Model, the # 17 Marble Front. This clock came in several sizes, this being one of the largest. The chapter ring of the dial measures 22 inches with the total of width of the clock being 24.25 inches. 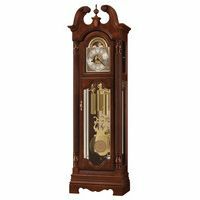 The clocks is 43 inches tall and extremely heavy. The E. Howard signed movement is in excellent condition and runs great. 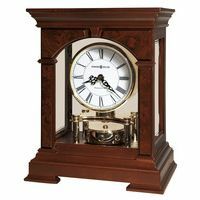 The pendulum adjustment for this clock is on the top of the case as all Howard marble and gallery clocks. The pendulum stick appears to be a replacement but works fine. The pendulum bob is a brightly polished one and seen thru the original glass at the bottom of the case. The weight appears to be from a Howard #70 turned sideways, not original but works fine and is never seen with the front of the clock in postion. The hands are in perfect condition and are the original E. Howard hands. The beautiful marble front is in great condition with a couple of scratches that are barley noticeable. The wood case appears to be gilded as you can see some chipping of the guess around the edges. It would require a lot of cleaning by a professional to bring back the gilding if so desired. One small chip of wood missing on the left middle of the backboard is the only real flaw as far as the wood case is concerned. 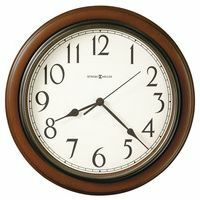 You don't often see a marble front wall clock this size and with no cracks or breaks to the marble. It is a very impressive and a massive clock to see.